At Carbon Numbers we understand the importance of being there when you need us. We are launching a new infrastructure, using dual servers that will deliver imperative remote service for our clients providing off site support, access to files and shared services much easier. With 85% of issues remotely fixed this proactive approach will allow us to monitor, control and support our clients with ease. 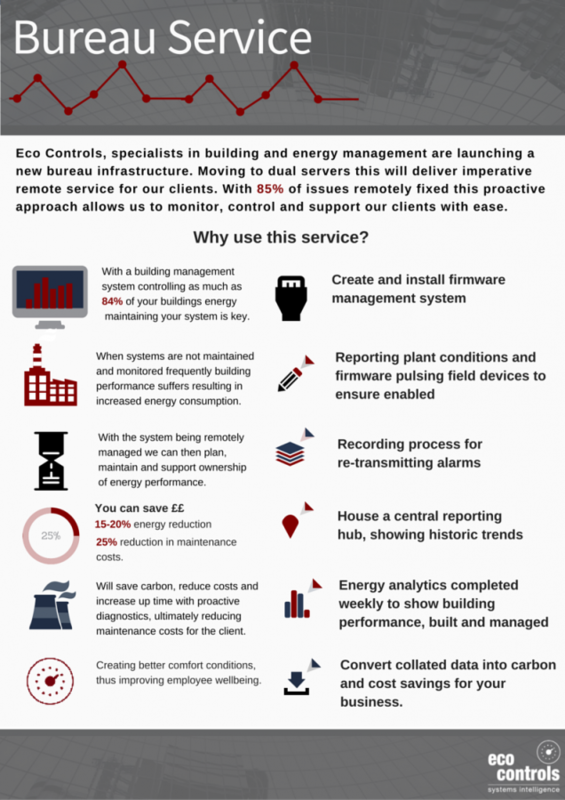 With a building management system controlling as much as 84% of your buildings energy consumption, maintaining your system is key, where systems are not maintained and monitored frequently building performance suffers resulting in increased energy consumption. With the system being remotely accessed and managed we can then foresee planning, maintenance and ownership of energy performance. This can create savings of up to 15-20% reduction in energy usage and a further 25% reduction in maintenance costs. By harnessing this energy and occupancy data, we will deliver improved occupant comfort, increased product life and ultimately reduce maintenance costs for the client. We have ability to turn this into knowledge that will save carbon, reduce costs and increase uptime with proactive diagnostics. As well as the carbon, cost benefits and CSR (corporate social responsibility), the bureau services will contribute to getting your company compliant for such as the requirements of the Energy Savings Opportunity Scheme (ESOS). Contact us on 01206 263390 to discuss your options to manage your buildings energy using this service. Prev:Merry Christmas & Happy New Year!